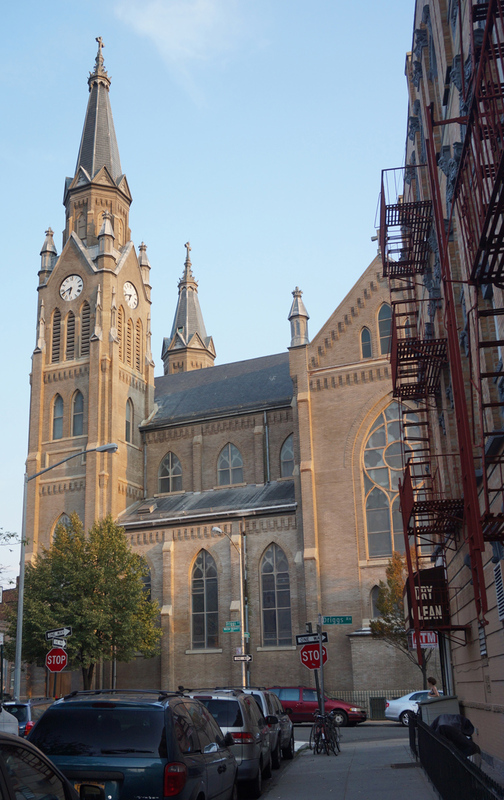 Until 1896 Greenpoint's Polish residents had to commute to St. Casimir’s in Ft. Greene for church services in their native language. 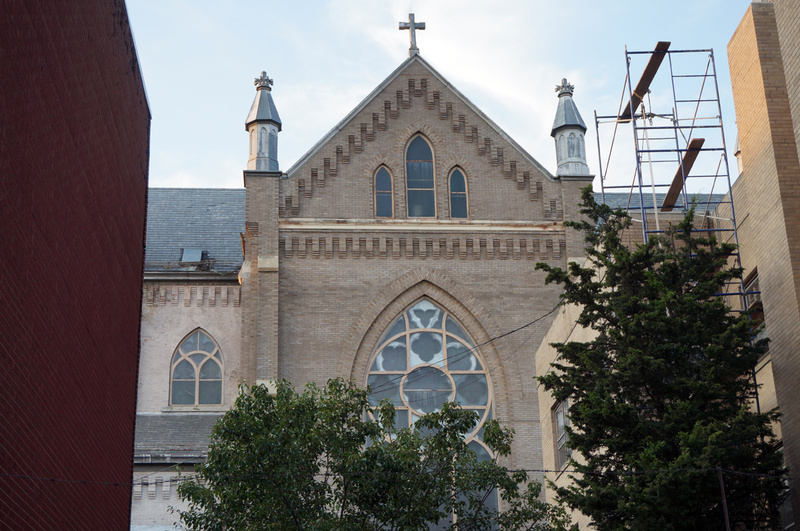 Anticipating an increase in demand for services in Polish, Father Leon Wysiecki of St. Casimir’s established a new church in Greenpoint. He began by purchasing 10 lots at Humboldt Street and Driggs Avenue. Then, Father Wysiecki had a wood frame church erected to serve the community until his vision of a larger church could be realized. St. Casimir’s administered the church until Father Wysiecki became its pastor 1898. Following the wood framed church was the structure we see today. 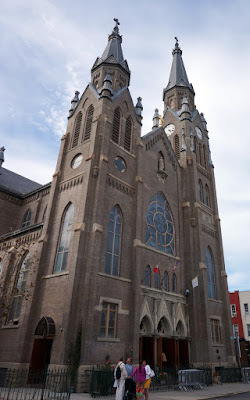 The existing monumental house of worship was dedicated on November 13, 1904 during the Feast of St. Stanislaus Kostka. St. Stanislaus Kostka Church in Greenpoint is the oldest and largest remaining Polish Catholic congregation in Brooklyn and it maintains its Polish cultural and social traditions. The church continues to celebrate Koleda, the January feast of the three kings, Polaski Day, the signing of Poland’s constitution in 1791, and other Polish national holidays. In addition, the church has kept archives documenting its parishioners support for the people who struggled for survival in Poland during the two world wars. 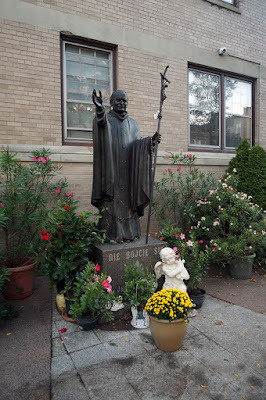 St. Stanislaus offers mass in English and Polish; however, English Mass is held in the basement while Polish Mass is held in the main sanctuary. The church’s rich architectural detailing and brick masonry sits in stark contrast with the clapboard and aluminum siding of the neighborhood it resides in. A Neo-Gothic structure, St. Stanislaus features asymmetrical twin spires, pointed arches and a high pitched roof. Marble columns, gilded arches and stained glass windows can be seen in the nave, as well as a “lavishly painted vaulted ceiling” that includes a choir of angles. The church’s art collection includes an oil painting of the French Carmelite nun Theresa, a portrait of the Black Madonna is displayed on a side alter, and two large murals for the Patron Saint Stanislaus can be seen. In addition, there is a portrait and an exterior bronze sculpture of Pope John Paul II (1920-2005), the first Polish Pope. 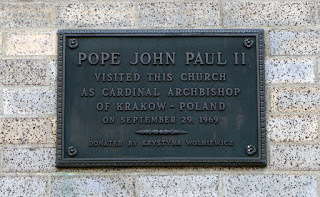 The former Pope visited the church as a Cardinal in 1969. Located on the Fulton Street Mall between Bridge and Duffield Streets, the Offerman building is a landmarked Romanesque Revival style structure designed by architect Peter J. Lauritzen. 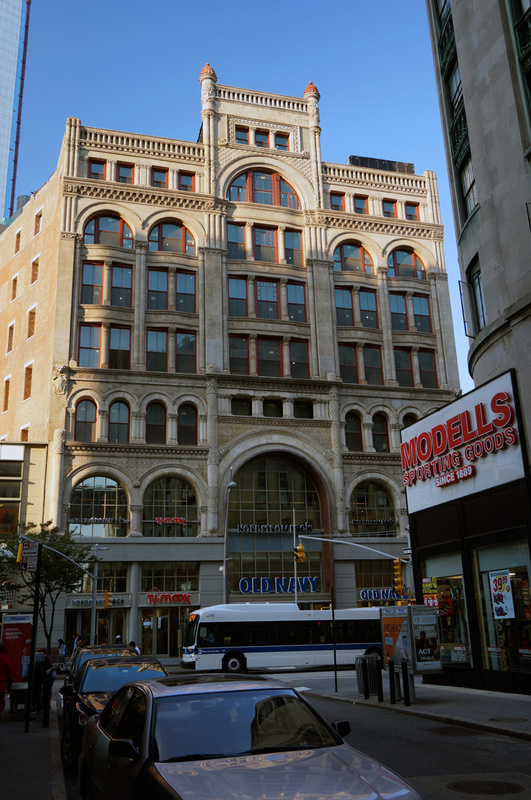 The Offerman Building was one of the tallest buildings in the borough at the time of construction. 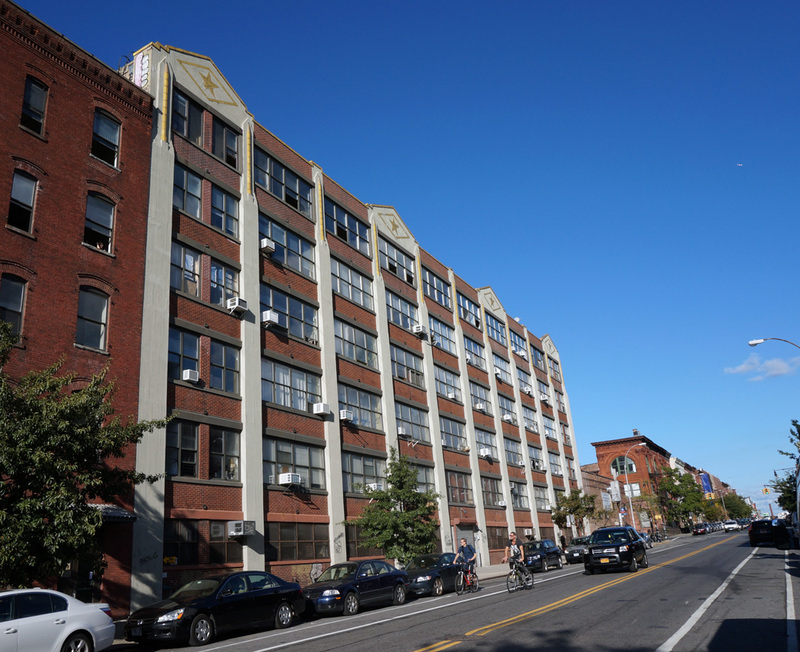 The lots that comprise the site for the Offerman Building were acquired in two phases, so the building was constructed in two phases. The first eight lots were purchased in 1889 and 1890 for $235,000. The construction ground breaking began in 1890, hence the 18 and 90 above the Fulton Street entrance (photo above). In 1892 ten additional lots were acquired, increasing the length of the building wing that fronted Duffield Street. A stone relief reading “1890 OFFERMAN BUILDING 1892” commemorates the starting dates for each phase of construction. 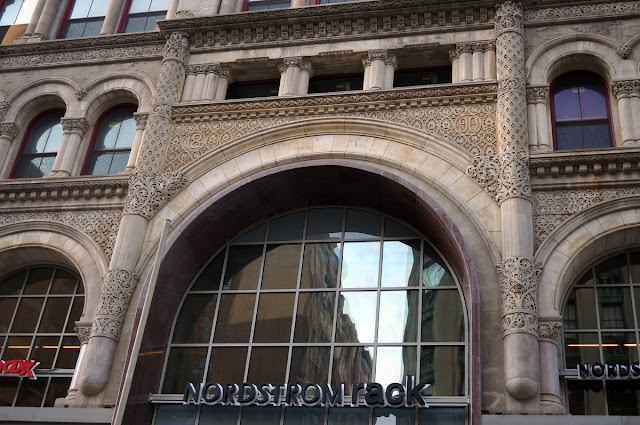 Referred to as a "sleazy alteration" by the AIA Guide to New York City, the street level facade on Fulton Street is a contemporary addition. 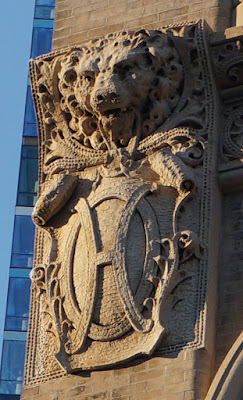 Most of the stone and terracotta architectural detailing above the pedestrian level remains intact. Born in Denmark in 1847 and trained at the Polytechnic School of Copenhagan, Architect Peter J. Lauritzen worked in Washington D.C. in the 1870s prior to moving to New York City in 1883. 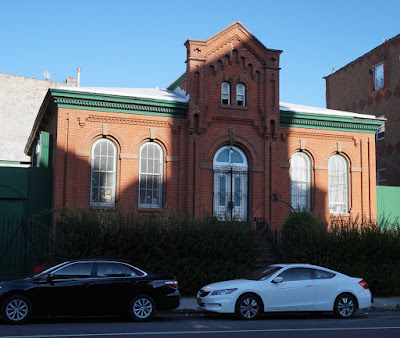 The architect gained notoriety when his unsolicited entry to the Manhattan Athletic Club design competition was selected as the winning proposal. 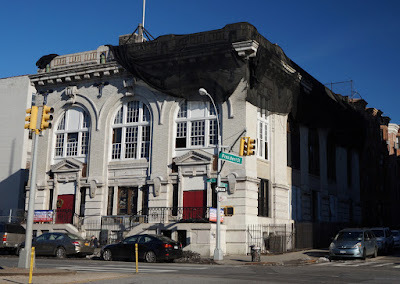 In Brooklyn he was known for designing the Union League Club building in Crown Heights, as well as several fire houses throughout the borough. 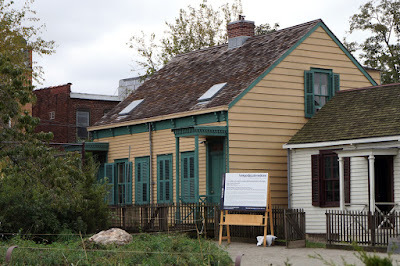 Lauritzen lived near the Offerman residence in Williamsburg and like Offerman he was socially active in Brooklyn. Lauritzen was a member of the Union League and Hanover Club. Henry Offerman (1823-1896) was a wealthy businessman. By the time he began engaging in real estate development, he was already a successful industrialist. Offerman was president of the Brooklyn Sugar Refining Company on the East River waterfront at South 2nd Street in Williamsburg. 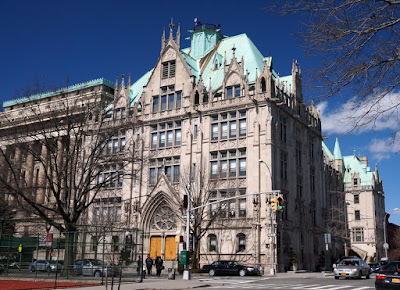 Offerman had been an elder of the German Evangelical Lutheran Church at 63 Schermerhorn Street and supported related causes like the German Hospital Society of Brooklyn. In addition, he was involved with several German shooting clubs and helped to found the first national sharpshooters tournament in 1895. 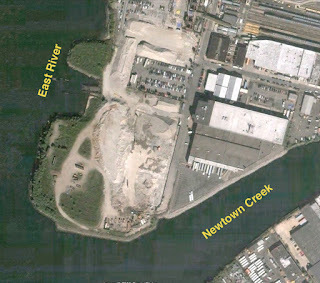 Hunter’s Point is the land mass of Long Island City bordered by Newtown Creek, the East River and Queens Plaza. Hunter’s Point South is a development along the East River. 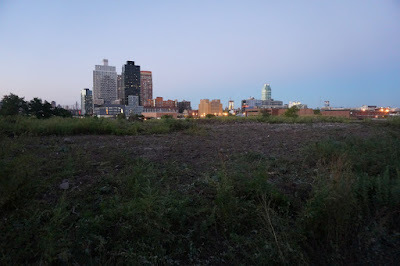 A friend and I recently paid a visit to the abandoned southwestern tip of the Point at the mouth of Newtown Creek to see what’s left of the old East River waterfront. If you want to get an idea of what parts of the Brooklyn and Queens waterfronts were once like, I recommend taking a trip over the Pulaski Bridge into Long Island City to check it out before it’s gone for good. 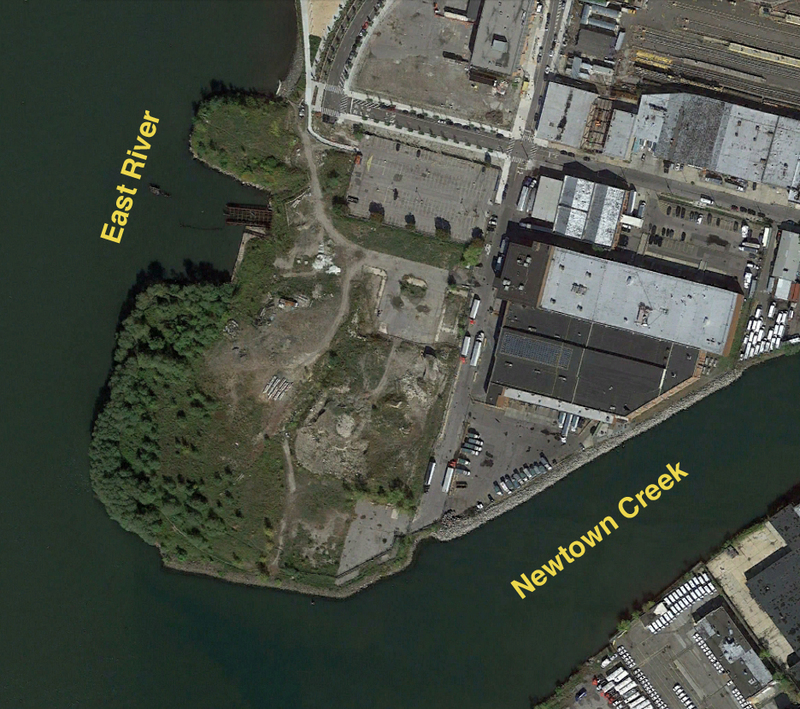 The name Hunters Point comes from Captain George Hunter who maintained a “low island farm” on the banks of Newtown Creek with his wife Ann. Their estate was comprised of 210 acres. 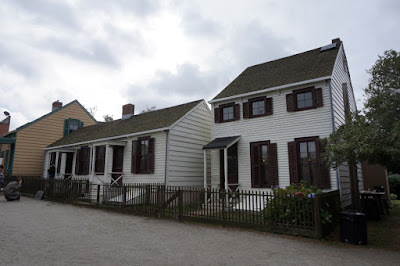 By 1833 the captain and Ann had passed away leaving their estate to be sold by there three sons. The land was sold for 100,000 in 1835 to Jeremiah Johnson who resold the land two years later for $200,000. Between 1852 and 1853 the estate’s hills were removed and used as fill between present day 5th Street and the bulkhead along the east river. In addition, streets and adjacent building lots were parsed out for sale to home buyers. 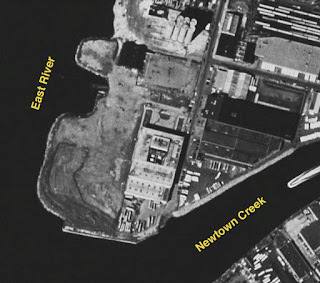 There used to be a large industrial building on the eastern portion of the site. That building was demolished sometime around 2004 and all that remains of the facility is a small parking lot used by contractors. Since 2004 most of the site has been used for construction staging and stock piling. 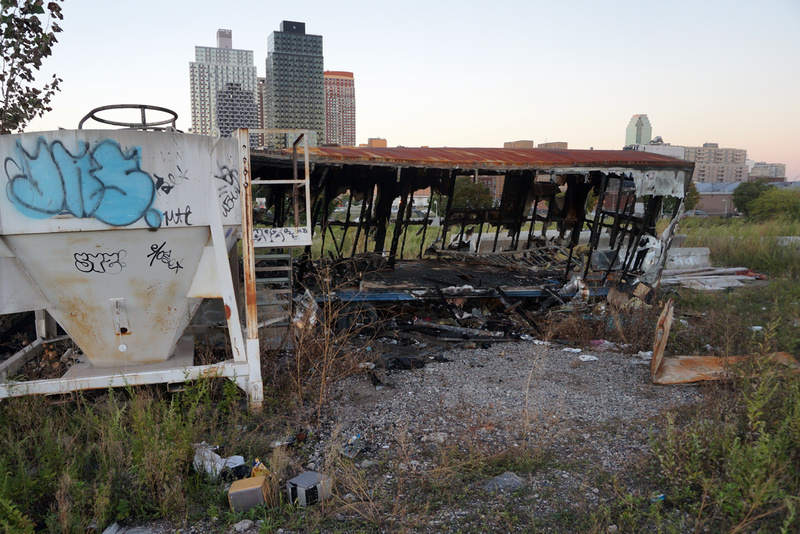 The trailer that burned down sometime within the last several months was once a construction field office. Other construction equipment and materials can be found scattered throughout the weeds. The area looks as though it has recently been cleared, although most of the site has been kept devoid of large trees since at least the 1990s. Much of the larger vegetation that has been allowed to remain is along the water and is made up of fast growing weed trees, like Cottonwood and Ailanthus. The area is frequented by visitors. 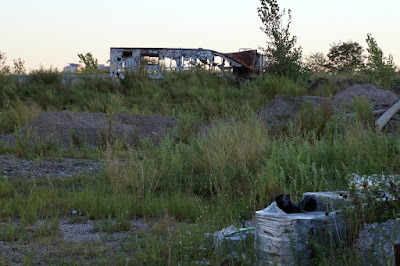 Urban explorers, squatters, graffiti artists, dog walkers high school students and others have made this patch of Hunter’s Point their playground, or in some cases their temporary home. There is evidence of people using the abandoned construction trailer as a crash pad and in the woods along the river is a sturdy makeshift tent with a skyline view. Although, it did not appear as though either shelter was inhabited. All good things must come to an end. 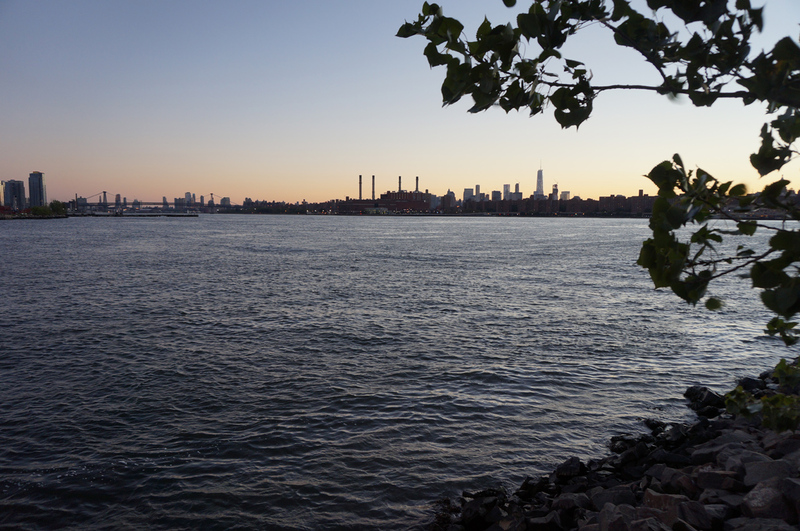 There have been plans to develop this piece of land since 1983 and while it remains undeveloped, the expansion of Gantry State Park and addition of another gated community in the sky will soon transform this landscape into a formal urban space. 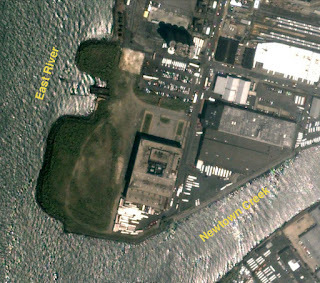 According to Curbed, a request for proposal was let in May of 2014 for the final phase of construction of the Hunter’s Point South development. So, act quickly if you wish to see this relic the of New York City waterfront. The city council is considering bill Intro 775 that would impose limits on the amount of time that the Landmarks Preservations Commission (LPC) has to designate individual landmarks, as well as historic districts. The bill would also bar reevaluation, for five years, any building that is not processed within a year and any district that is not processed in two years of their initial evaluation. Supporters argue that the bill is needed to deal with the LPC's backlog, as well as make the landmarking process more efficient. Virtually every preservationist group including the LPC has vocalized opposition to this bill. The bill's strongest supporters are those in the development community who stand to gain financially from a weaker LPC. I vehemently oppose the passage of this unnecessary bill. The LPC's backlog includes 94 buildings, some of them backlogged for as long as 20 years. The LPC, under its new head, has devised its own plan for dealing with the backlog. The commission plans to deal with the items in public hearings organized by borough. Imposing arbitrary deadlines to deal with a mere 94 potential landmark sites is overkill and the LPC should be allowed to process applications thoughtfully and without interference from outside entities. 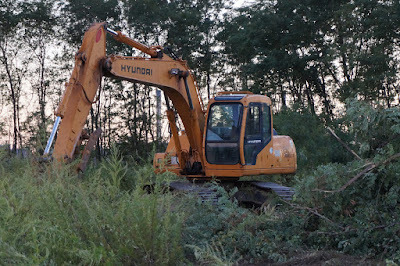 According to the New York Times, Councilman David G. Greenfield of Brooklyn, the chairman of the council's Committee on Land Use, and the bill's co-sponsor, argued that the commission does not deserve special treatment from any other government body. "We have timelines at the City Council, City Planning, the Department of Buildings". 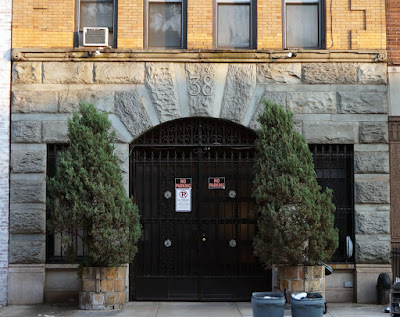 "If we can do it, the Landmarks Commission can do it, too". That argument implies that the LPC isn't doing their job as well as they should or could be. It is hardly a fair argument. You know what else would speed up the landmarking process? Staffing the LPC commensurate with their workload. 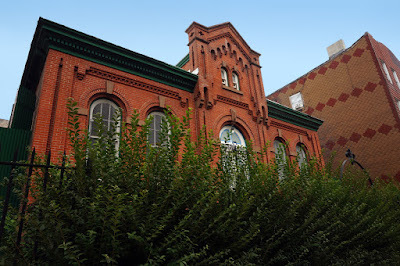 According to the Greenwich Village Society for Historic Preservation (GVSHP), the Landmark's Preservation Commission is the city's smallest agency with the fewest resources and smallest staff despite having to oversee more than 33,000 properties in addition to considering new landmark designations. It is one of the most understaffed agencies in the city. Moreover, the GVSHP states that 80 percent of designations already take place within the proposed time frame. "The bill swats a fly with a sledge hammer". The LPC is not an institution designed to impede real-estate development. It exists to protect the architectural heritage of New York City. The vast majority of buildings in the city are not considered landmark worthy within the confines of the LPC's guidelines. Non-architecturally important buildings can be repurposed, modified or demolished as property owners and developers see fit. This developer friendly bill should not jeopardize the precious few buildings that the LPC considers worth protecting in perpetuity. Intro 775 should not be allowed to pass. Imposing arbitrary deadlines could mean the loss of a piece of history. 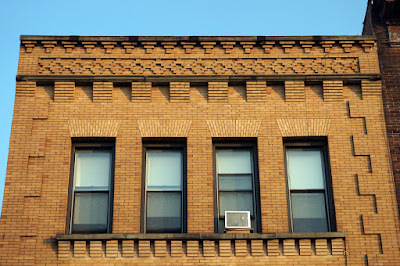 Maintaining the architectural integrity of our neighborhoods is what connects us to them and creates the city's sense of place. What would this city be like without its historic buildings like Grand Central Station, the Chrysler and Empire State Buildings? It would be a placeless city, anywhere U.S.A. If you feel as I do, then I encourage you to contact your city council member to voice opposition to this bill. It’s not too late. You can look up your council member and their contact info under "Who We Are" on the New York City Council website. 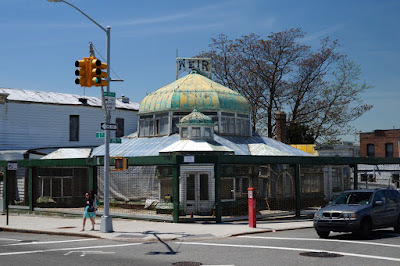 Below are some landmarked buildings from around Brooklyn that have been featured on this blog. Without their landmark status many would be torn down while the rest would be at risk. 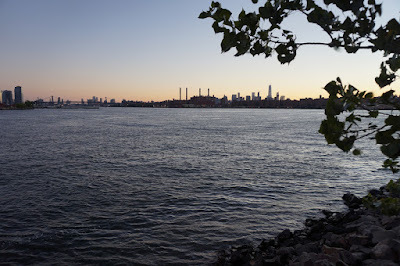 Above is the Domino Sugar Refinery, an icon of Williamsburg's industrial vernacular architecture. The building on the left has landmark status. The building on the right did not receive landmark protection and was demolished to make way for high-rise luxury condos. Public Bath No. 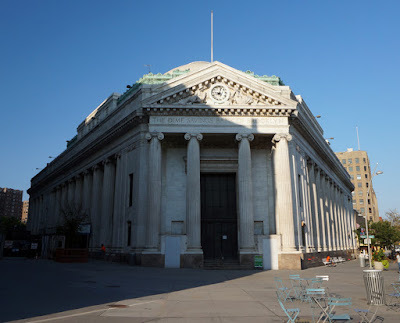 7 aka the Brooklyn Lyceum in Park Slope is the only remaining municipal bath building in Brooklyn that hasn't been demolished or heavily modified. It sits on prime real-estate that could easily be redeveloped. One of the common arguments against granting landmark status to buildings is that they are sometimes left to rot. 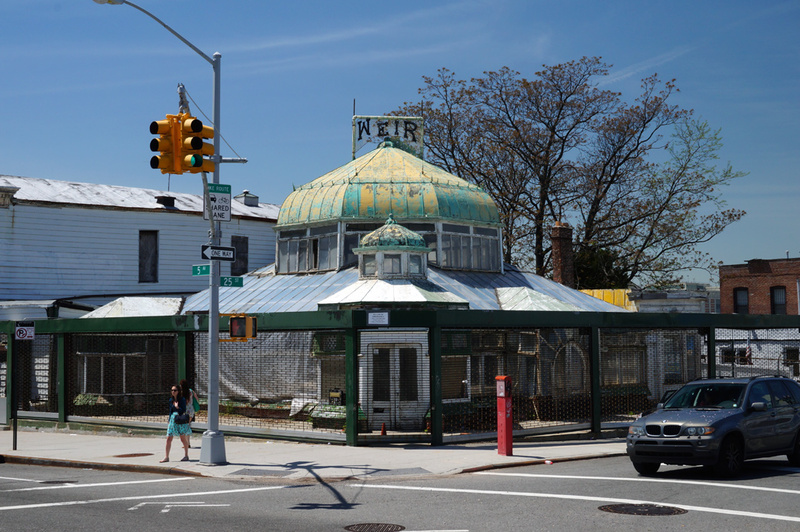 However, those cases are rare and eventually many abandoned landmarked buildings are purchased and rehabilitated. A case in point is the McGovern Weir Greenhouse pictured above. It has been purchased by Greenwood Cemetery and is currently undergoing renovations. The building above, with the terra-cotta pencils, is the most iconic of the several Pencil Factory buildings that make up the Pencil Factory Historic District. 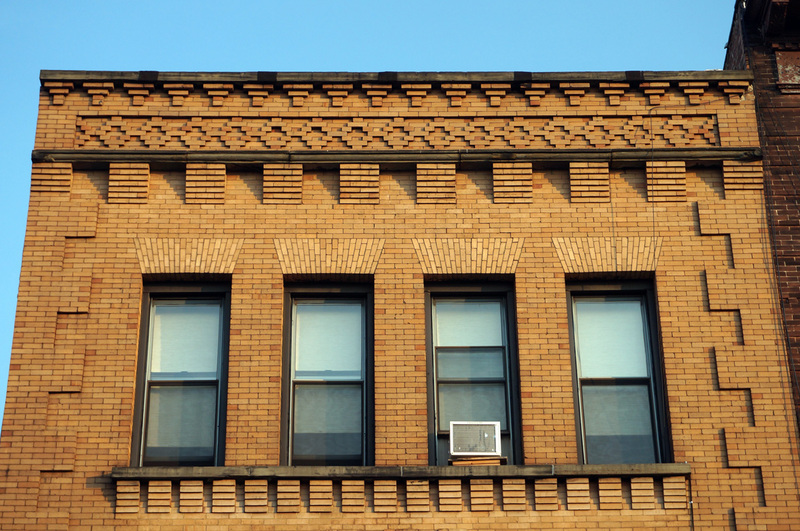 The buildings are part of what defines the character of Greenpoint and represent a significant piece of Brooklyn's history. Near the East River waterfront they are in prime redevelopment territory and would be at serious risk of being lost where it not for their landmark status. 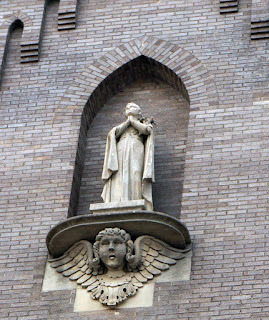 The Our Lady Queen of All Saints Church falls within the Fort Greene Historic District. Many churches have been lost over the years. It would be a shame if some day this one were allowed to be replaced by condos or commercial buildings. To many these humble residential structures known as the Hunterfly Road Houses may not look like much but they are of significant historic value and losing them would be a travesty. Sitting on the border of Crown Heights and Bed-Stuy, they are all that remains of Weeksville, one of the first free African American communities founded in New York. The property the former Dime Savings Bank sits on was recently sold to a pair of developers known for their high-rise residential buildings. 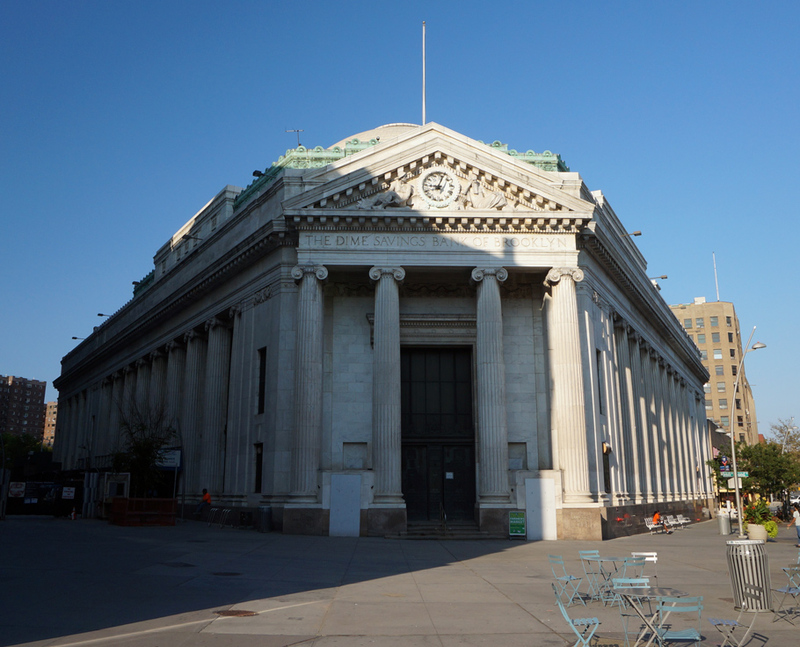 Fortunately, the bank building is landmarked and will have to be included in whatever design the developers have envisioned for this spot. P.S. 34, the Oliver H. Perry School in Greenpoint, is a landmarked school building at 131 Norman Avenue between Eckford Street and McGuinness Boulevard. According to the book Brooklyn’s Historic Greenpoint, “P.S. 34 is one of the city’s oldest school buildings still in use”. The school was named after Oliver H. Perry, a war hero from the battle of Lake Erie in the war of 1812. The building’s architectural style is a blend of Renaissance and Romanesque revivals. Designed by architect Samuel B. Leonard, the school was built in 1867, with an addition in 1870 and a subsequent addition in 1888. Leonard designed the initial structure, as well as the first addition to the building and James W. Naughton designed the second expansion. 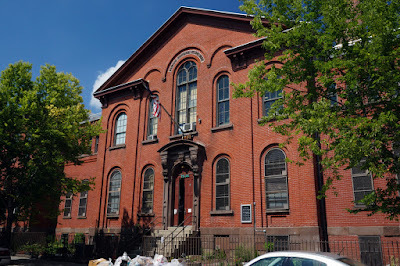 Both men were architects for the Brooklyn school system and made significant contributions to the borough’s school buildings. 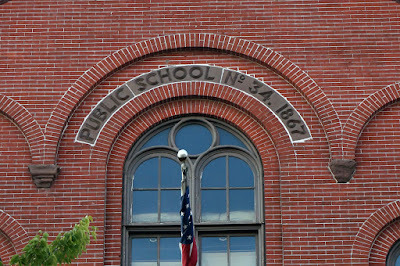 Leonard designed the building formerly known as Colored School No. 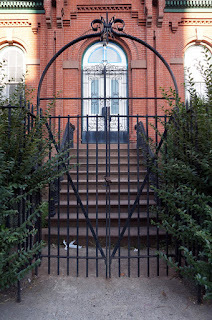 3 in Williamsburg, which is now a landmarked private residence. Naughton also designed the Boy’s High School in Bed-Stuy (which Brownstoner recently posted as their building of the day). Colored School No. 3 began as the African Free School of Williamsburg in 1841. The school was annexed by the Williamsburg School District in 1844. 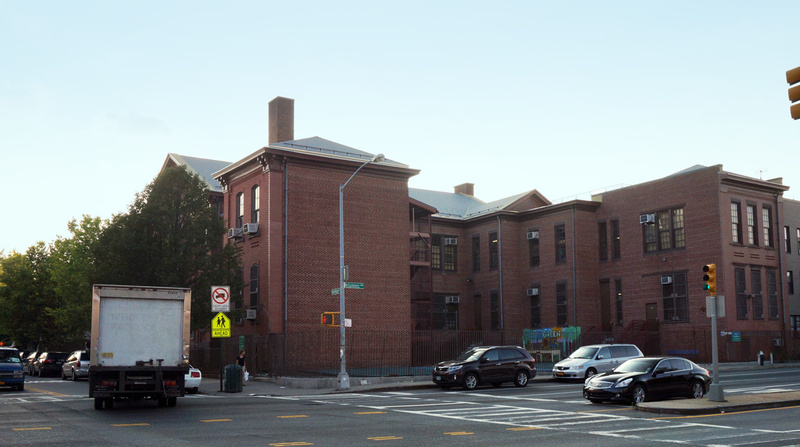 The school’s growth required larger facilities and after moving 3 times settled at 270 Union Avenue. In 1868 the original building was deemed unfit for use and 9 years later funds were made available for the school building that remains today. The AIA Guide to New York describes the school as an “Italian Romanesque miniature for a school in Williamsburg’s rural days”. The school has arched window openings and a prominent entrance with large keystones, a raised central section with a gable and blind arcade, corbeled brickwork, and dentil courses. The building was named Colored School No. 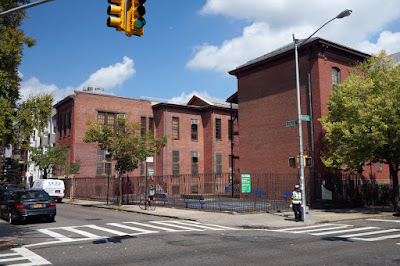 3 by the Board of Education of the City of Brooklyn, which maintained a race based segregated school system throughout much of the eighteen hundreds. 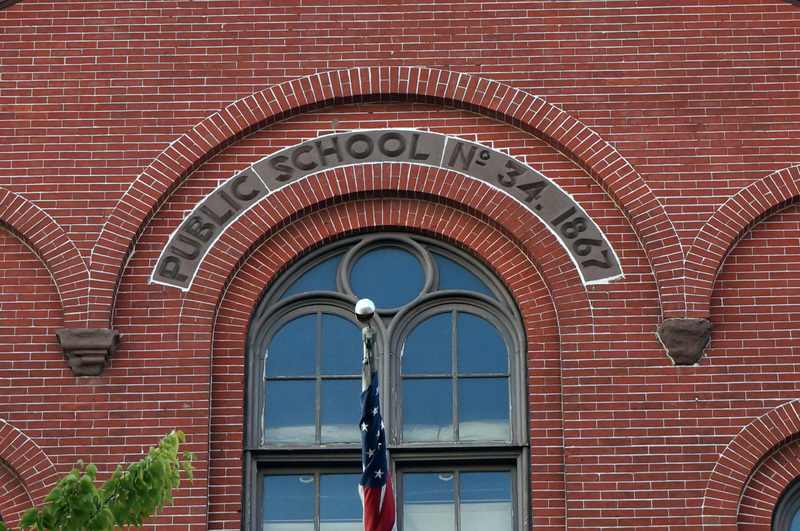 The school’s nomenclature changed in 1887 when it was renamed to P.S. 69. Later, the school was annexed by P.S. 18 and desegregated. The facility became independent school P.S. 191 in 1924, and then closed in 1932. After closing, the building was used by the Public Works Commission for WPA projects until the depression ended. Then, the sanitation department utilized the building until it was abandoned by the city and left to decay. Like many buildings on this blog, the former school was saved by artists. In 1983 James and Linda Clark, artists that needed a place to live and work, purchased the building and still live there today. 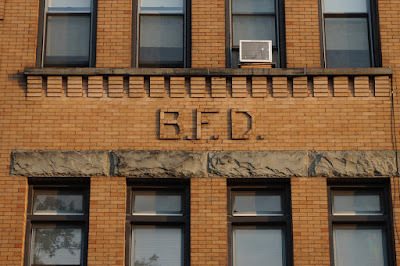 BFD Engine Company 38 Firehouse - B.F.D. 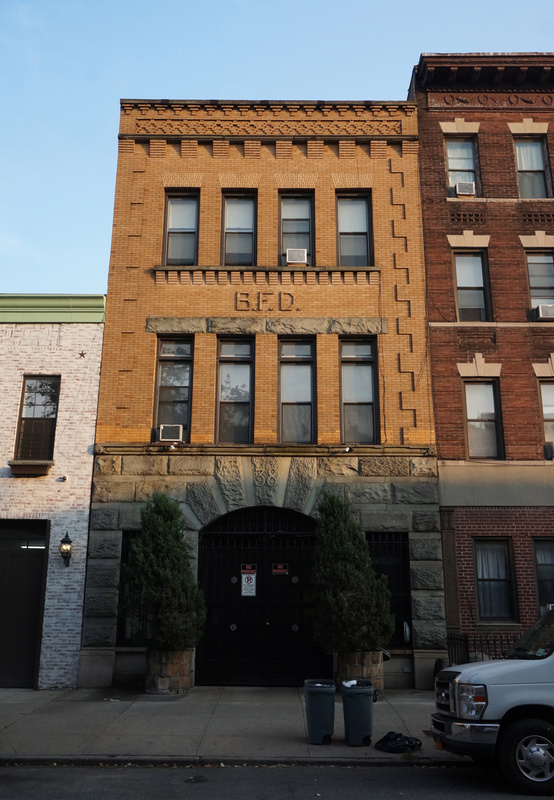 Compared to other Brooklyn Fire Department buildings constructed during the same era, the Engine Company 38 building’s design is understated. The building’s first floor façade is constructed from rusticated bluestone. 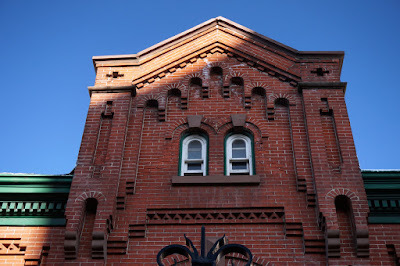 The upper two floors are brick with brick patterns and relief used to create a cornice and quoining. Bluestone lintels over the second floor windows and a bluestone sill under the third floor windows frame the B.F.D. lettering. Engine Company 38 was first commissioned when Greenpoint was an industrial neighborhood. At the time industries received little regulatory scrutiny, often resulting in dangerous working conditions. The Faber Pencil Factory, Chelsea Fiber Mill, American Manufacturing Company and a Standard Oil Refinery were some of the large manufacturers in Greenpoint. Industrial disasters were relatively common and Engine Company 38 would have been among the first responders to neighborhood fires and explosions. 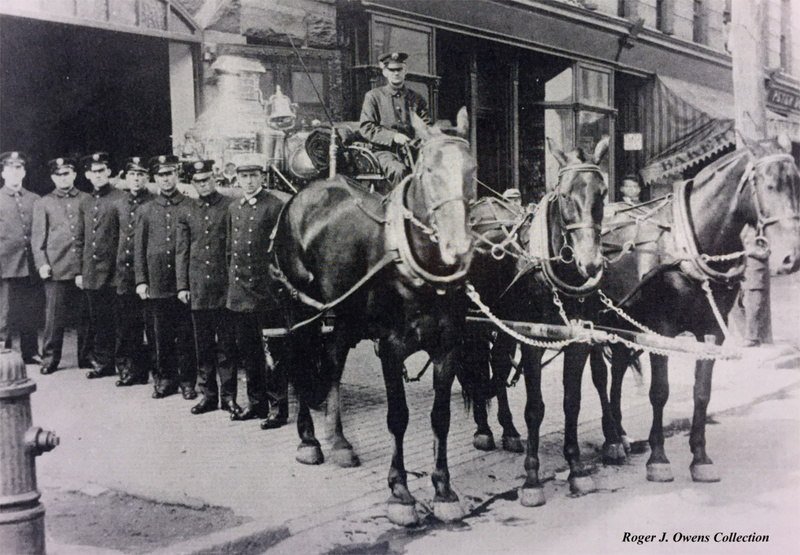 Engine Company 38 was organized on July 15th, 1895. It was reorganized to Engine Company 138 after Brooklyn became part of New York City in 1898 and the Brooklyn Fire Department (B.F.D.) was incorporated into the Fire Department of New York (F.D.N.Y.). In 1913 the fire companies were reorganized again and Engine 138 became Engine 238. Each reorganization added 100 to the original company number for all of the borough’s fire companies. The firehouse at 176 Norman Avenue was vacated when Engine Company 238 moved to 205 Greenpoint Avenue with Hook & Ladder Company 106. According to a Daily News article the firehouse closed down after budget cutbacks and became surplus city property in 1976. After closing the city attempted to rent out the property, at one point for an animal shelter, before selling it in 1980. 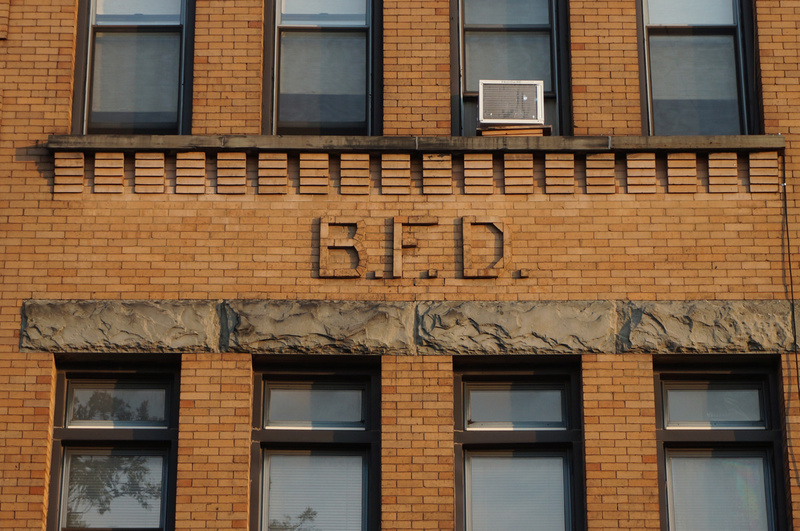 In 1985 the building was sold to its current owners, Walter Kenul and Janet Rutkowski, who operate a studio out of the building called BFD Firehouse Studios. They produce architectural iron work and large scale sculptures.